What is the world's slowest animal? The following is a list of the slowest animals in the world. For the world's slowest animals, getting from one place to another is a very time-consuming endeavor. Luckily for these species, who move in strides ranging from stagnant to very slow, their lifestyles and vitality have adapted to allow for them to flourish in spite of their minimal movements. Corals, sea sponges, and mussels are a member of a group of living organisms known as sessile. The word "sessile" means that these animals survive without moving at all. Corals are invertebrates that primarily live in marine habitats existing as compact colonies of genetically identical polyps. Coral reefs reproduce asexually but also breed sexually through spawning. Coral reefs are also responsible for providing food and shelter for the other marine species, playing a significant role in biodiversity. Moving at a speed of only 0.000023 m/s, the banana slug is often regarded as the slowest animal in the world, outside of living organisms who do not move. Banana slug (Ariolimax columbianus) is a common name given to the three species of North American terrestrial slugs in the Ariolimax genus. 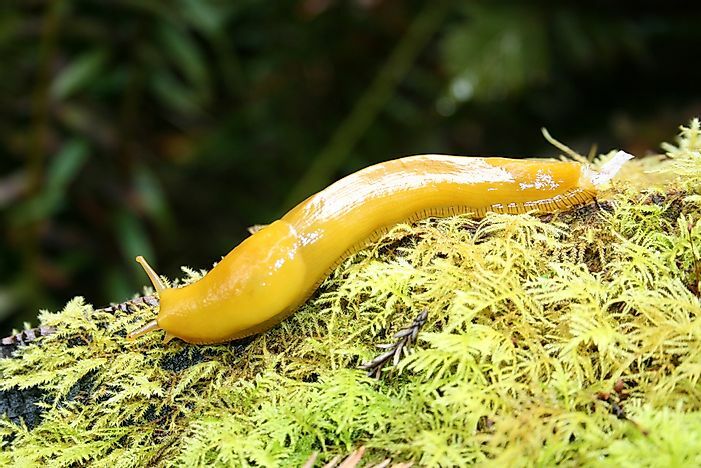 Banana slugs are mostly yellow in color, and some have brown spots resembling a ripe banana, hence their name. Some banana slugs may also be tan, brown, white or greenish. The dwarf seahorse (Hippocampus zosterae) is a special type of seahorse species found close to the shores of the Bahamas and other regions of the US. The dwarf seahorse is the world's slowest moving fish, swimming at about 0.01mph. Dwarf seahorses tend to stay in a unique place, for that reason the species is mostly threatened by habitat loss. Unlike most of the other fish, the dwarf seahorse is monogamous and mates for life. The dwarf seahorse is rare and is among the only species of animals on earth where the male bear the offspring. The starfish is one of the world's slowest moving animals, moving at a marginal speed of only 0.01 miles per hour on average. Often compared to land snails for their slow movements, starfish are marine animals who live in the water. Despite their name, they are not actually fish. One amazing fact about starfish is their ability to regenerate limbs - this means that if a starfish loses one of its arms, it can grow it back! Snails are notoriously portrayed as slow-moving, and there is truth to this idea. The average garden snail moves only 0.029 miles every hour! Garden snails originally come from Europe, although they can be found all over the world. Garden snails are herbivores. Sloths are often portrayed as lazy animals who only exhibit movement when it's absolutely necessary. Truthfully, the sloth is a very slow animal. In fact, three-toed sloths generally cover a distance of only around 0.15 miles every hour! Sloths are arboreal in nature, which means that they prefer to spend most of their time in trees, descending rarely. The Galapagos tortoise (Chelonoidis nigra), also known as the giant tortoise, is the longest living vertebrate in the world. At present, the giant galapagos tortoise only exists on two remote archipelagos - one in Aldabra about 435 miles east of Tanzania and the other in West Ecuador. The Galapagos tortoise is the world's slowest reptile, moving as slow as 0.23 miles per hour on land and only slightly faster in water. The giant tortoises have a heavy body with a weight of up to 770 pounds which hinders the tortoise's ability to move swiftly. Which Animals Move The Slowest?